In Phase 2 of our build out, we propose putting our offices on top of the existing office suite on the east side and building a catwalk over to the warehouse space on the western side, near the water and our shop MARY A. WHALEN. Great ideas for the building space alongside our ship MARY A. WHALEN on Pier 11 in Atlantic Basin. On Monday 2/25/19, we presented to Brooklyn Community Board 6 (CB6) Economic/Waterfront/Community Development & Housing Committee (EWCDH) with an update on our business plan requested by the NYC EDC to enable PortSide to expand into the warehouse adjoining our ship MARY A. WHALEN. This presentation put our real estate story into the context of waterfront planning issues given the mission of the committee. Here is the Powerpoint that we presented, lightly edited to add some slides to cover things that were conveyed orally. Here is the handout we had, info on how to make this all happen by joining PortSide as a board member, advisor, fundraising committee member, etc. What follows are some renderings from our business plan and below that photos and videos from our presentation of the business plan to the NYC EDC on 1/8/19. Plan below: The orange outline is the square footage amount that the NYC EDC promised PortSide from 2008 through early 2011 (yes, we are trying to get space that was previously promised to us) and the other lines reflect our requests to increase the space. We presented justifications for each bump out. We did this as a walkabout through the site, followed by a sit-down meeting in the conference room. We would change these spaces over time, in a phased renovation concurrent with our use of them, and end up putting our own offices above the existing office suite (elevating it for resiliency), using the space below for program space, building a catwalk from there to the western wall, improving the bathrooms and more. Our years of operating as a pop-up will be very helpful in this scenario. We started our pitch on the NYC Ferry dock to emphasize our theme that Atlantic Basin is the “maritime gateway to Red Hook” and merits the enhancements PortSide proposes. Several of these (1-3 below) involve using information from our e-museum Red Hook WaterStories. an expanded, year-round PortSide in the southern end of the warehouse enabling us to do more programs than on our ship MARY A. WHALEN. The goal is a PortSide that better serves Red Hook AND that creates a compelling gateway to Red Hook that helps draw cruise terminal and ferry passengers into the neighborhood. Below: Councilman Carlos Menchaca has been a powerful advocate for PortSide NewYork. 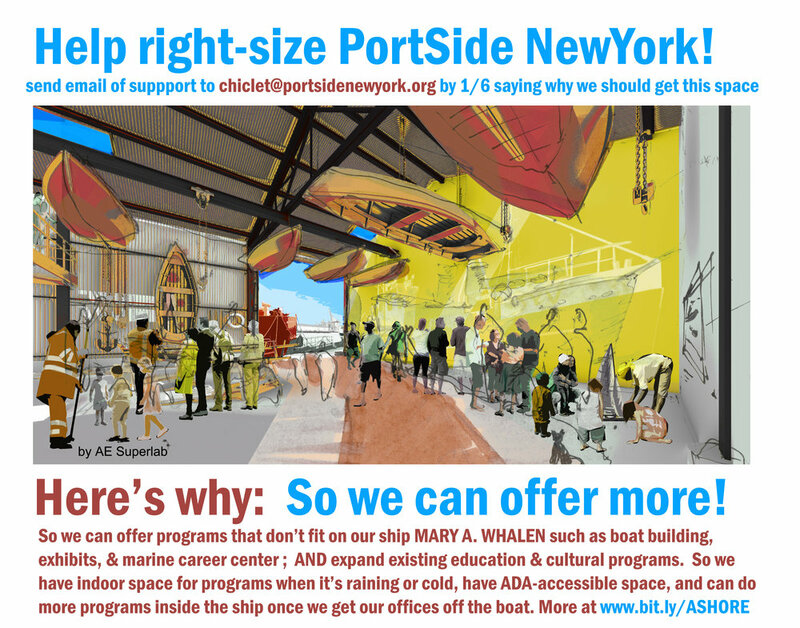 He negotiated with the NYC EDC to get us our current space for our ship, the MARY A. WHALEN, in 2015; and he has followed up with strong support for our efforts to get the building space here that was promised to us by the EDC from 2008 through early 2011. Below: PortSide NewYork presentation of our business plan to NYC EDC on 1/8/19. Carolina Salguero positions our plan as creating the maritime gateway to Red Hook, speaking on the NYC Ferry dock. Our plan includes expansion into the building alongside our ship MARY A. WHALEN. Below: Let’s make this weed patch educational! Carolina Salguero explains how changing signs will explain this urban wild patch, it’s nesting birds, plants and WaterStories, the connector between the NYC Ferry dock and our ship MARY A. WHALEN. Below: Hear one of our partners, Shannon Hummel, the founder of Cora Dance, explain the potential of the warehouse section of the space to impact Red Hook and the performing arts community of NYC. This building space will allow PortSide NewYork to better serve Red Hook, both via our own programs and by having space that we can make available for community meetings, events and performances by other non-profits. Our lead architect Severn Clay-Youman of Civic Architecture Workshop is at left. The liferaft behind them will be our mobile Children’s Reading Room. Below: a rendering of the planned community and performance space Shannon spoke about in the video above. 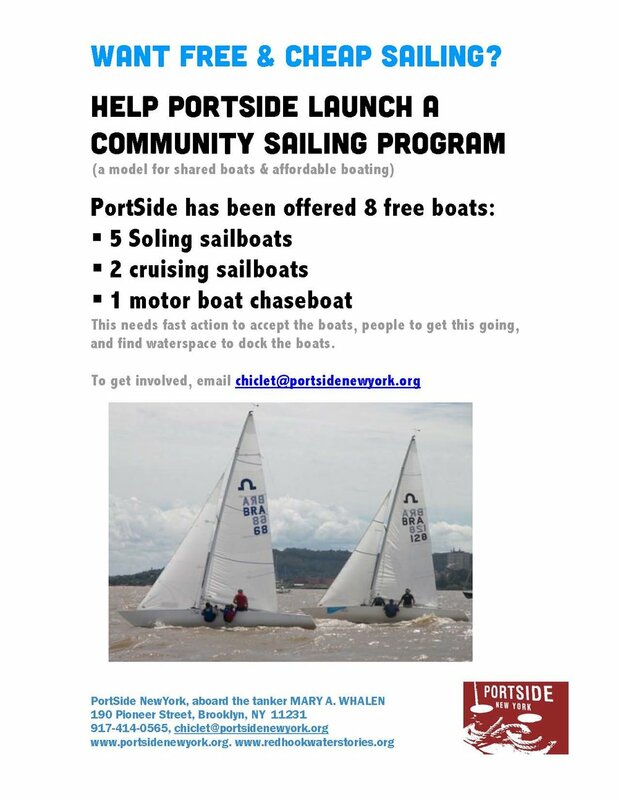 The day before Thanksgiving 2018, PortSide was offered all the boats from a Community Sailing program that lost its space. Our outreach in Red Hook shows many people interested in having such a program here. See our flyer at right. We need to find a waterspace for the boats during the summer. Atlantic Basin is full, has ferry traffic and exiting Atlantic Basin puts you in very fast currents with heavy ship traffic. If this is a go, we propose to have the Community Sailing program use the above “warehouse” portion of the space from January to May (when it is too cold in there for exhibits and performing arts) as a winter shipyard to repair and store the sailboats. Our boat building program in an adjoining space could also roll projects out into this space. It can simultaneously be used for messy educational projects such as a pop-up wet lab and maker space for projects with schools. This could also be a rain-proof place to build floats for the October Barnacle Parade and host a Red Hook Winter Holiday Market before the sailboats get in there. Below left: Shannon and Carolina explained how the loading dock will be a great outdoor stage or place for classes, small ship repair and STEM projects. Several community members helped set up and were in attendance. Below right: an example of how PortSide used this loading dock in the past with our WHSAD interns to restore wheelhouse windows from our ship MARY A. WHALEN. Below: AE Superlab bring their model of the building to the meeting. Principal Ahmed ElHusseiny is at left, Edson Pinto at right. The quotations over the windows were excerpted from letters of support that were submitted to the EDC. The windows look out over the loading dock and to Imlay Street. Below: We are excited by how how easily this conference room can be used for conferences, book readings, talks, small exhibitions. This shows about a third of it. The person speaking at center, Carmen Rainieri of SKANSKA, is our construction estimator on this project. Below: We received over 30 letters of support. Quotations from them ringed the room. Compilation of over 30 letters of support from elected officials, and members of the land and maritime communities. You can add your support for this effort by sending an email to our project manager at the EDC at adees@edc.nyc and copy us at chiclet@portsidenewyork.org. Thanks much!